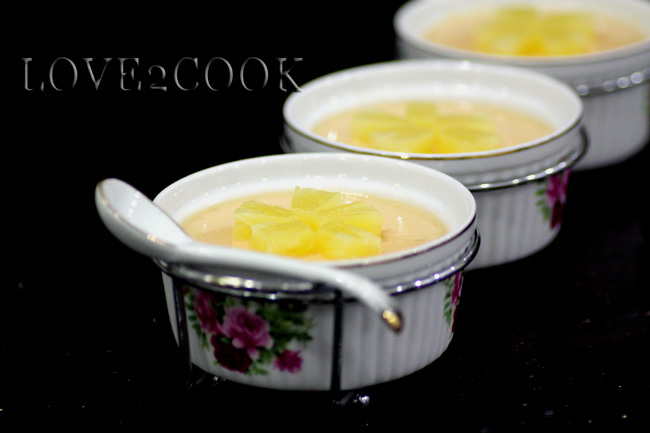 Suppose to make Lychee Pudding by Kak Hanieliza. But only later I found out that I don't have any canned lychee available at my shelf. But I had canned pineapple, so used it instead. Followed measurement by Kak Nor and got the result I wanted. Simply delicious pudding, a scoop was never enough! Have it chilled, U'll forget the world...try it! Here's the translated recipe...bunch of thanks to both sifus!!! Blend canned fruits with 1 cup of sugar syrup from the can (just for seconds, not to make it too fine). Boil agar-agar powder with water until dissolved. Add sugar, continue boiling till sugar dissolves. Turn off heat. Mix in the evaporated milk and blend fruits. Stir well. I've posted my version of Lychee Pudding HERE before...! Aite, have a great weekend ahead friends! Hi Love, thanks for the award. Sedap nampak your pineapple puddings. hai..love, thanks for the award. nice your puding, akak memang suke puding bnyk tu, mintak akak yg besar tau! 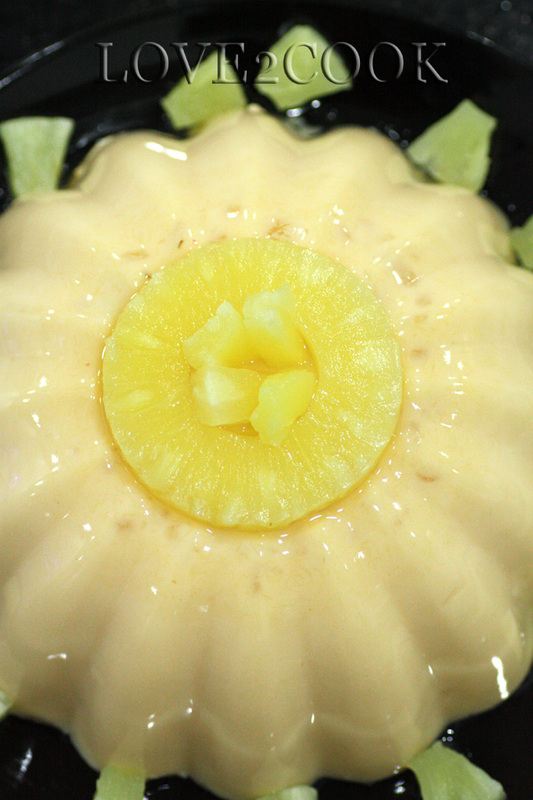 he..he.., bekas roses tu pun cntik..
great pineapple pudding..and those pics..goshh fantastic!! have a great weekend dear..
Hi, thanks for stopping by my blog. I am so happy to have found yet another Malaysian blogger (I'm a Malaysian myself!) as I live in Australia and always get craving attacks for Msian food... blogs help me get my dose of drooling over the delicious food, lol. This pudding looks delicious!!! 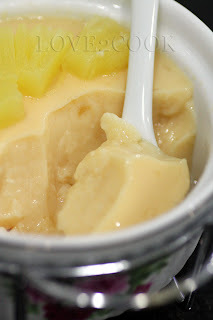 I love puddings in general.. mango pudding, lychee pudding, pineapple.. semua ada semua suka!! Hi Love..sedapnya nampak puding nanas tuh! 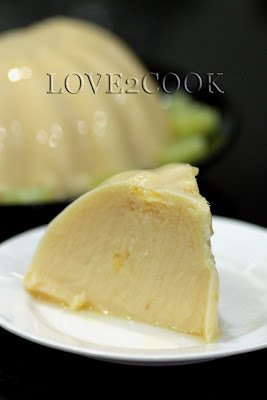 wow really yummy puding dear! Yummy pudding, truly very tempting..
too tempting clicks...! 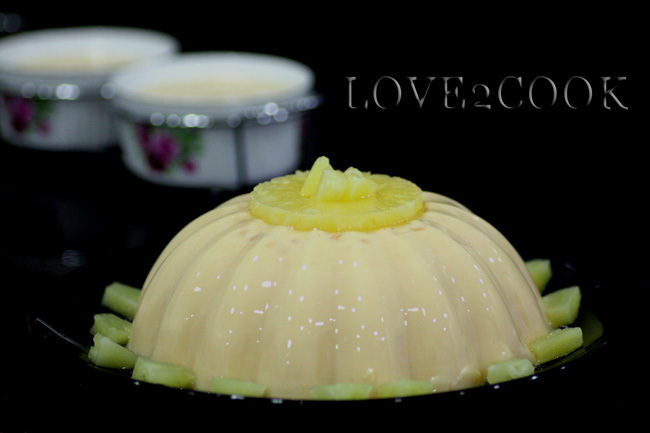 delicious pudding recipe...can t wait to giv a try..! Thank you for visiting my blog! You have a wonderful space here...! The pudding looks absolutely divine! Look at this pudding, remind me I have too long did not make any pudding..yummy yummy. So you actually bought that casserol from Jusco, nampak cantik juga.. This pudding must be very light and tasty. I love pineapple. Ow...! This looks awesome. Good idea to try with pineapple...! Beautiful presentation ma, i simply adore ur work.